Happy Easter from our crazy house to yours! We wish you all an enjoyable day with family and friends. This is my oldest hooligan when he was two years old. He was soooo into The Wiggles and Bob the Builder. It looks like the Easter Bunny made his day. At the time I was still a hyper-spastic mother and made sure my 4 month old had an Easter basket that was as big as he was. He really needed all the things that were in his basket. He really did! Cathy–Does your husband look like you? I hope so because your adorable boys look just like their mother! Happy Easter. Adorable! Just realized I don’t know how old your boys are – I’m going to go back up and read your profile – don’t know why I didn’t do it yet. Happy Easter! I love how the basket is just as big as him. Cute! Happy Easter to you and your family! Hope you have a great day! 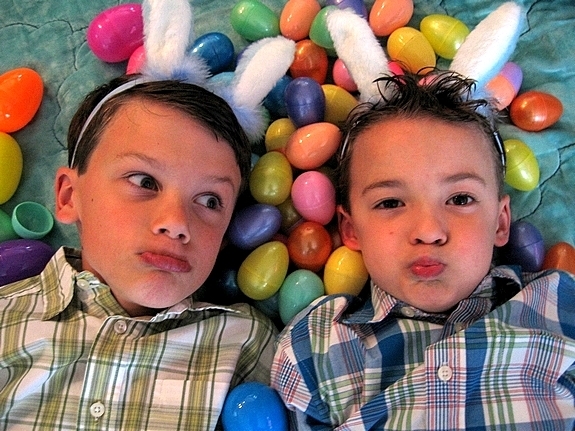 Aww, Easter cuteness. Hoppy–er, happy Easter to you! Mind you I’m not complainging but I was really hoping for Easter dimples! Wow! The Easter Bunny likes your kids waaaaaaaay more than he likes mine! Clearly. Your Easter Bunny rocks!! Cute kids! And the baby looks SO THRILLED, LOL! Great pictures!